"Come and surf safari with me...."
I have a confession to make to you all: It was Transworld Surf that convinced me that purchasing an XBox was a good decision. Not quite falling into a killer app category, Transworld Surf is the strongest wave-riding game I have seen to date. Utilising a revolutionary wave engine, Angel Studios have hit upon what other developers could only dream of.. the perfect wave on a video game. Having the Transworld name behind the title also means that a lot of care and detail has been put into this game. The title is 100% official and all surfer's real life sponsors and boards have been digitally represented. The attention to detail is absolutely staggering on this title and the graphics are such that on many an occasion I was content to just paddle about admiring the view. None of these screenshots do the title justice in the slightest. 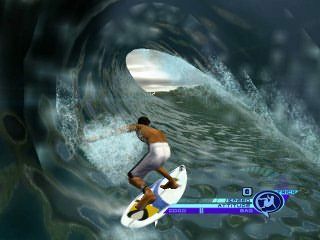 The last time I saw wave motion this nice was on Splashdown for PS2, however this game simulates surfable waves whereas Splashdown covered ridable wakes. This is an important point to make and one that went heavily in favour of this title. 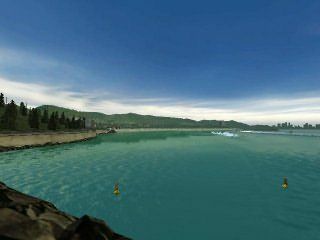 Surf locales are accurately represented with Kirra Point in Queensland also featured in the game. Also you can surf as Taj Burrows and also get a quick audio grab from him as well when you select his character. When choosing your characters and equipment there is a great spoken intro/info on each area that will totally immerse you and make you feel part of the surfing scene. Probably the only downside to the game was how long you have to paddle out to your wave. Considering you are on a time limit, this could have been reduced somewhat. However, that said, you can just utilise a jet ski to take you out there quick smart. There are multiple breaks at each locale, making for a fantastic surfing experience. Animations are smooth and realistically portray tricks. There are various modes of play available making the title virtually infinitely replayable. Game modes are abundant, including the full pro tour taking you to the best breaks all over the globe. You must complete goals in this mode in order to unlock new levels. There are also multiplayer games for you and your mates to compete against each other in: King of the Wave, Free Surf and Competition. In a nutshell the idea of the game is to score as high as you can with a variety of tricks, everything from standard manoeuvres all the way through to extreme stunts have been shown. You can link combos to get higher scores but beware of the dreaded wipeout as you'll wind up with nothing. Tube riding is fantastic and shows off the graphical grunt of the XBox console. The water looks fantastic and as you ride the wave in to the shore you can see the details of the land ahead of you. Real surfers will be highly impressed with the detail of the title. Either Angel Studios are a bunch of skegs or they have someone passionate about surfing assisting with information to make this the best surfing game ever on the video screen! Upcoming titles such as Kelly Slater Pro Surfer have an extremely high bar to climb to match this fantastic game!